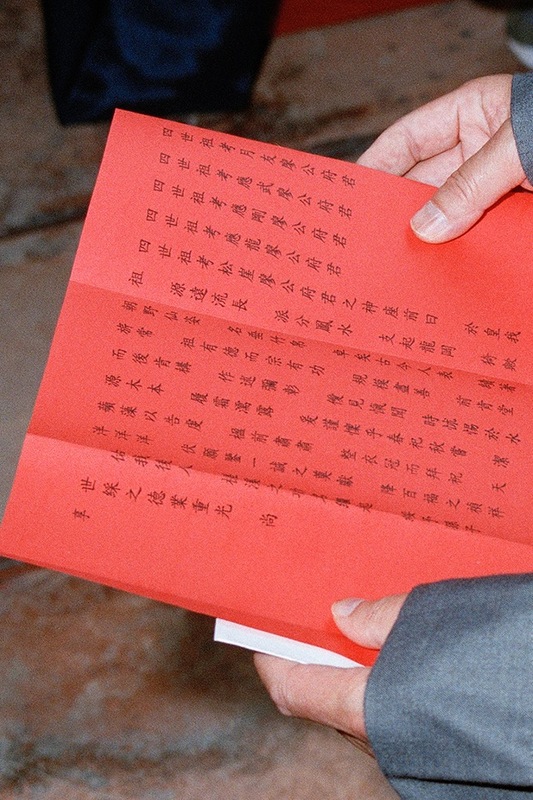 Chants for the rite are inscribed on red paper. 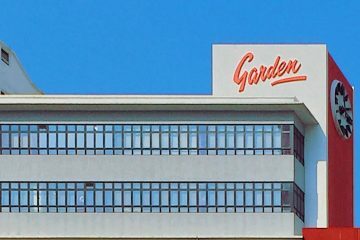 Sheung Shui Wai is only a fifteen minute walk from the MTR station, shopping malls and main roads of Sheung Shui’s town centre, which has become a popular destination for cross-border shoppers. But it feels much further than that. As we approach, highrises give way to low-slung village houses and ancient trees in concrete planters. 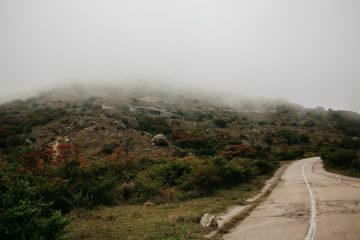 The contrast reminds us that while Hong Kong is broadly thought of as a modern metropolis, there are deeply storied traditions that still persist, hidden among communities like this one. We’re visiting the village today in order to observe one such tradition. 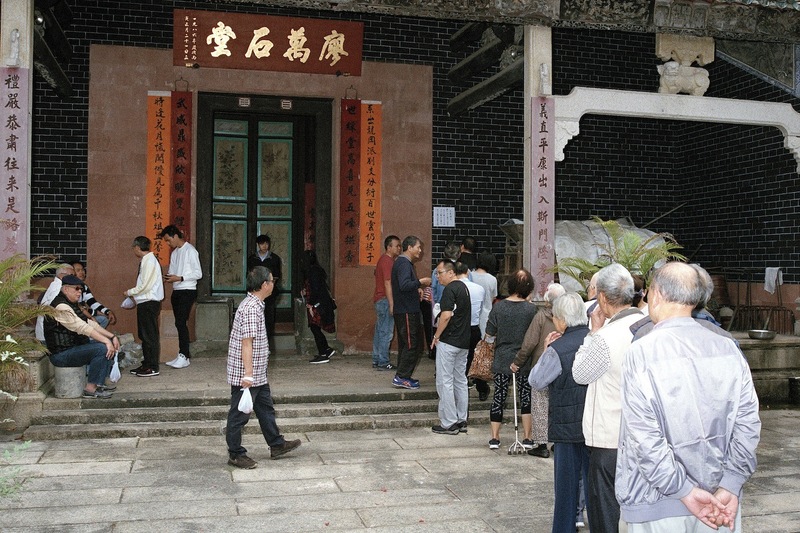 The Liu clan is one of seven clans in the city that still perform the annual Spring Rite, which takes place on the second day of the second lunar month – which this year was March 18. 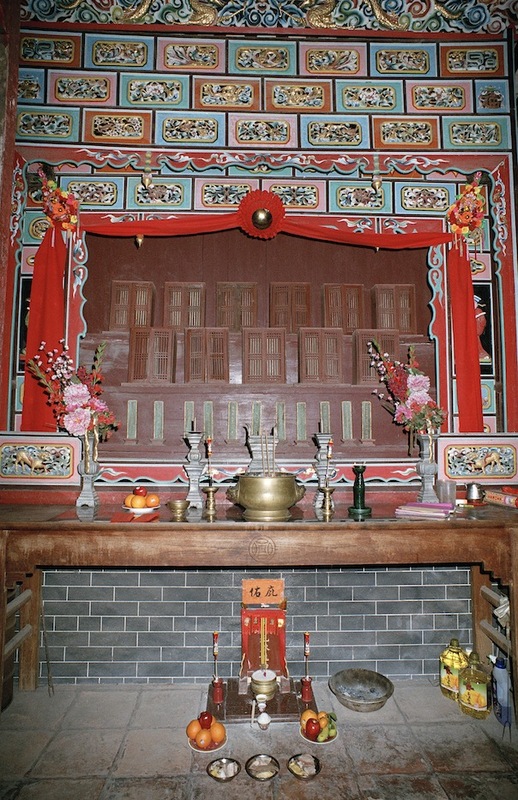 Usually performed by an entire clan in an ancestral hall rather than in individual family households, it’s a ceremony that has been in existence since the end of the Ming Dynasty (1368–1644). 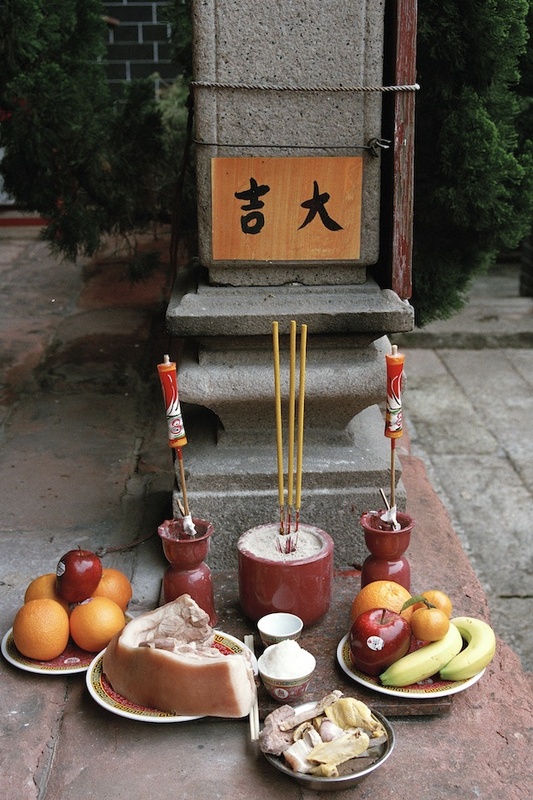 Performed by members of the village committee, the rite venerates the clan’s progenitors and worships the deities: the God of Dragon (lung4 san4 龍神 ), God of Earth (tou2 san4 土神 ), Pui Yin (pui3 jin4 配賢, ancestors that were ranked or titled sages) and Pui Heung (pui3 hoeng2 配享, ancestors who were civil servants). 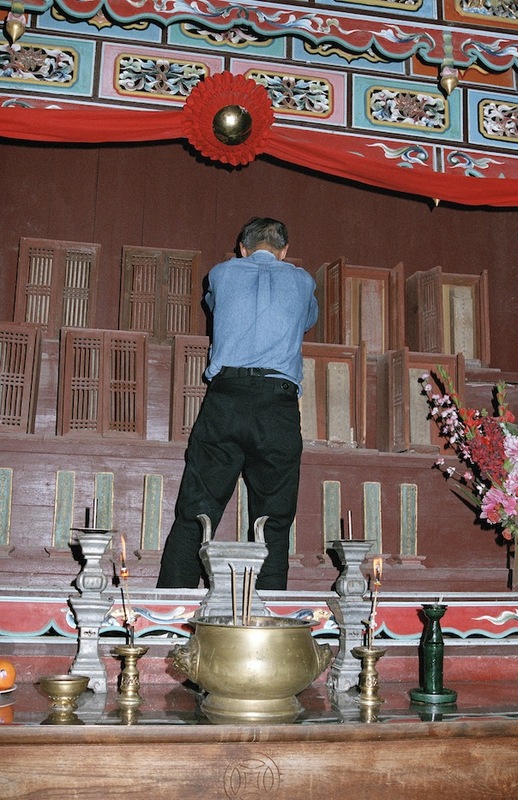 In the central shrine of the ancestral hall, names of these ancestors are inscribed on 11 tablets. 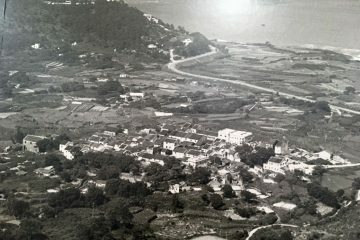 Sheung Shui Wai is one of many walled villages in the New Territories that were established by Cantonese (also known as Punti, bun2 dei6 本地, “local”) and Hakka communities during the Qing and Ming dynasties to serve as defence against pirates roving the shores. Like plenty of walled villages in Hong Kong, though, most of the walls were destroyed as the clan expanded the village area. Now, remnants of the original walls and gates intermingle with more modern residences, while metal awnings and antennas on the tops of buildings are punctuated by the occasional traditional sloping roof whose tiles are crumbling but still intact. 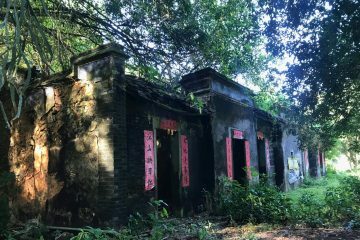 Amidst these vestiges of buildings from years past is the Liu Man Shek Tong Ancestral Hall. The Liu clan built it in 1752 as a celebration of their good fortune, having risen to considerable power and wealth since their first ancestors came to Hong Kong from Fujian during the Yuan Dynasty at around 1350. The declared monument has been painstakingly preserved since, with restorations being performed in the 1980s and 90s. Villagers gather in the hall for meetings, discussions, special occasions and, of course, to perform rituals. Aside from the Spring Rite, the Liu clan also celebrates an Autumn Rite and Mid-Autumn Festival. When we enter the hall, the clan members are busy putting the finishing touches on the Spring Rite preparations. A red table, draped with extravagantly designed cloths and bedecked in flowers and sticks of incense, has been loaded up with a spread of food that spans everything you’d need for a full course meal. The food is laid out in the order that you would consume it, beginning with tea, wine, rice and soup, going on to various meat, vegetable and seafood dishes, and culminating in fruits and sweets for dessert. Everything on the table is imbued with meaning, much of it related to a fertile harvest. 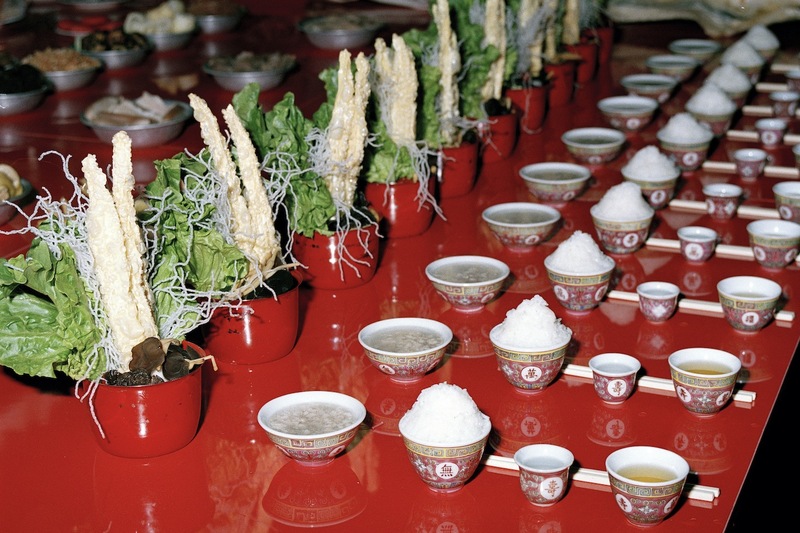 The dishes comprise five cooked foods and five raw foods, reflecting the saying “sap6 cyun4 sap6 mei5” (十全十美, “ten makes whole, ten makes beautiful”). A section of pork belly calls to mind flat expanses of fields. Another cut of meat is shaped like a pine cone, symbolising fertility as the cone is filled with seeds. Even a mouse is offered up, harking back to times when only the rich would have to worry about mice in their barns due to their abundant stores of grain. The spread faces the hall’s central shrine. The rows of miniature doors in the shrine are closed at the moment, but they will be opened later so that the spirits of the ancestors will be able to emerge to enjoy the offerings. While we examine the table, a professor and a class of university students fill the platform. Liu Chun-kui, the head of the village and one of the indigenous inhabitant representatives of the Sheung Shui District Rural Committee, explains some of the background behind the ceremony as the students busily take notes and photos. Visits from outsiders like us need to be reviewed and approved weeks in advance. Finally, everyone who isn’t involved in the ritual are politely requested to step down from the raised dais on which the table sits so that the ceremony can begin. The sticks of incense are lit, and sandalwood is placed in a burner on a smaller table in front of the table of offerings. Respects are paid to a smaller collection of offerings off to the side, dedicated to the Kan clan which the Lius inherited their land from. Firecrackers are set off and the gates to the hall are closed, preventing evil spirits from entering. A solemn silence descends as the clansmen gather around the central shrine to pay their respects before each taking their positions on the dais. The eldest member of the village committee has the honour of bowing and presenting the offerings to the shrine. So far along is he in age that two of the other clansmen support him from both sides as he makes his way around the hall. 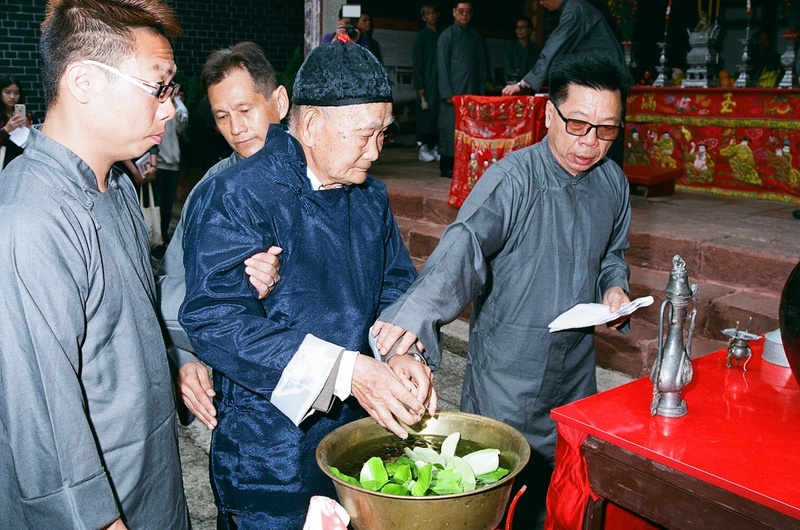 First, he washes his hands in a water bath of pomelo leaves, symbolising the cleansing away of bad luck. He then kneels and bows before the table of burning sandalwood followed by the table of offerings, the other clansmen passing him various dishes from the table for him to offer up. Between bows, the clansman leading the presentation of offerings makes his way over to another table off to the side, where he scoops wine from a large ceramic jar into a metal decanter. He repeats the process a number of times, with two of the other clansmen chanting in a call and response between certain steps of the ritual. After he has completed his offerings, this wine is poured into a small metal cup, which the rest of the clansmen take turns to pour out onto the ground in front of the platform in order of generational seniority. The observing clansmen step forward to take part in this step. Firecrackers are set off again as the gates are re-opened, and that’s it — the ceremony is complete. Some of the clansmen stay to chat and even take photos. Others go out to the hall entrance to pick up a portion of pork, an honour reserved for those over the age of 61, to recognise their seniority and contributions to the clan so far. In many ways, today’s Spring Rite exists only in fragments. Among the six musical instruments that used to be incorporated, only the gong and drum are still in use. 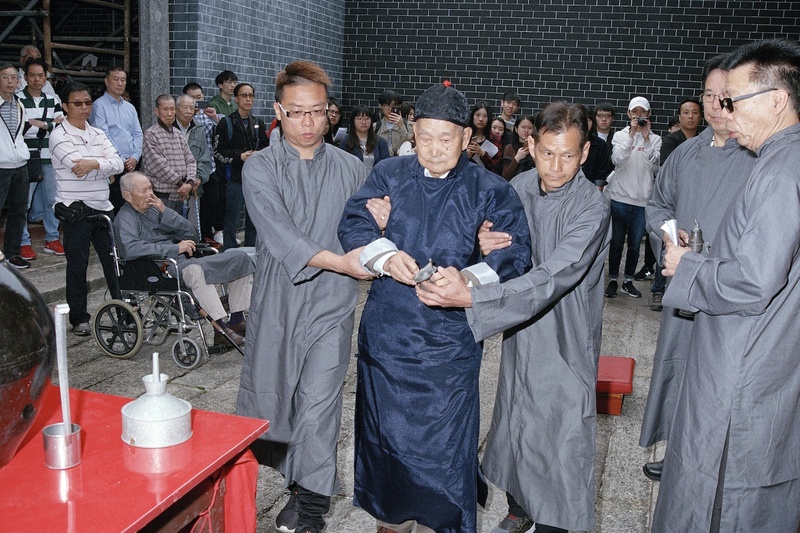 The recipe of the five colour cake (ng5 sik1 beng2 五色餅), a traditional dessert, has since been lost, so villagers carefully attempted to recreate it especially for the rite. In part, this gradual erosion of tradition is because clansmen have since passed away without being able to pass on their knowledge. As a result, the ritual has been trimmed back more and more over the years from its original length of three hours to less than an hour. Two younger men were among the clansmen participating in the ceremony, but aside from them and the visiting students, nobody gathered in the hall appeared to be under the age of 35. Even Liu, who has presided over some 30 years’ worth of Spring Rites, cannot explain the meaning behind certain aspects of it. “More and more of the elderly involved have passed away, while the younger generations aren’t interested in taking over or even learning about it,” says Liu, when he speaks to us later. While there are ritual classes that the younger villagers are encouraged to join, most of them either aren’t invested in preserving these traditions, or believe that it’s the older generations’ responsibility to do so. 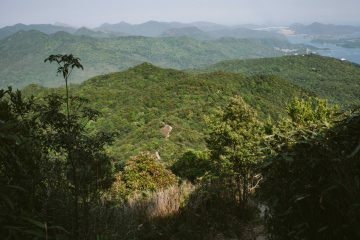 Sheung Shui Wai has been celebrating the Spring Rite for centuries – but as old generations disappear, so does the knowledge that keeps this tradition alive.